Easy to use&cost-effective web creation tool! WebEditor is designed for everyone. Powerful visual authoring environment allows you to simply add contents to webpages without knowledge of webcode. Site Wizard & Site Manager make creating and maintaining a complete website easier than ever. Advanced users can create and manage websites using our powerful tools such as Real-time synchronization between WYSIWYG Editing Mode & HTML/Quick Tag Editor. 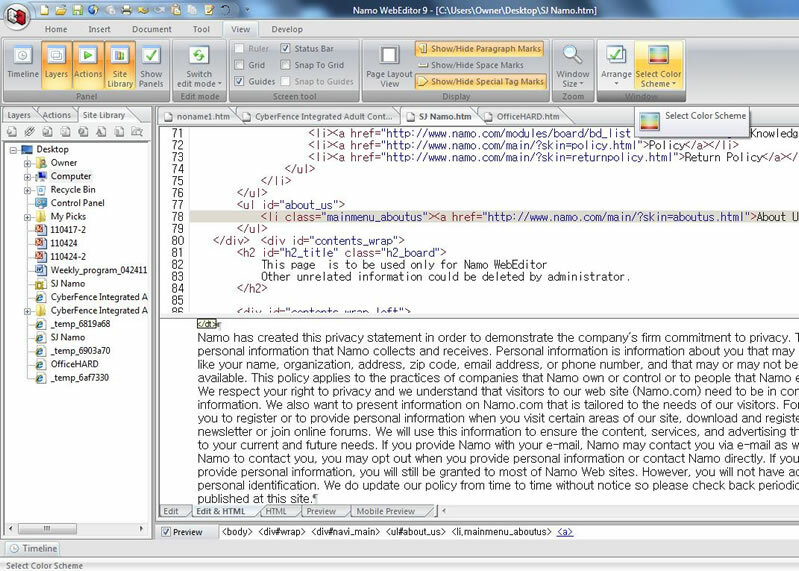 ...... Namo WebEditor9 features an improved a ribbon menu where toolbars are organized by tabs and often used commands can be accessed more easily than in previous versions. Our new improved UI will reduce your working time. You can also customize the Namo WebEditor user interface by picking a Color Scheme. Namo WebEditor offers three schemes: blue, black and gray. Choose the one you like the most. The Site Manager will help you to view your website as a whole. You can rearrange pages by clicking and dragging them on the Site Tree, and the Site Manager will automatically update the site structure and dynamic navigation bars. This is a quick and easy way to organize and update your site.Use our Site Library Panel to quickly access common site elements such as hyperlinks, images, music, etc. Qweas is providing links to Namo WebEditor 9 as a courtesy, and makes no representations regarding Namo WebEditor or any other applications or any information related thereto. Any questions, complaints or claims regarding this application Namo WebEditor 9 must be directed to the appropriate software vendor. You may click the publisher link of Namo WebEditor on the top of this page to get more details about the vendor.